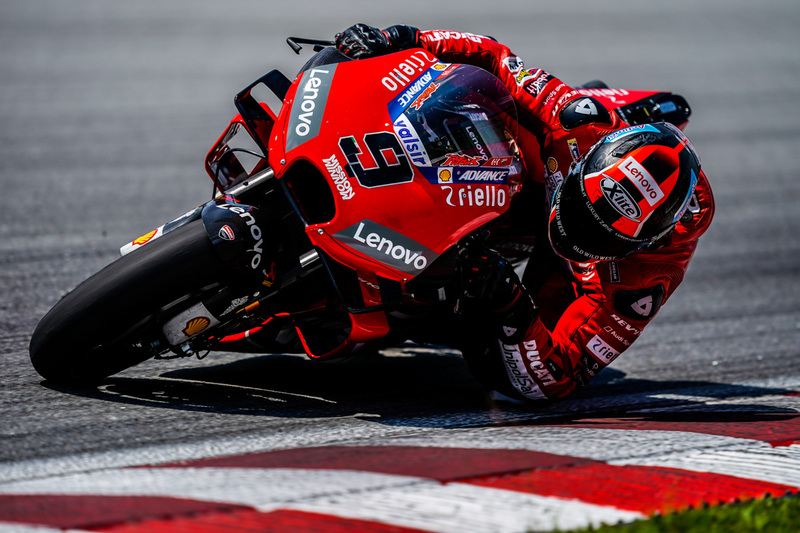 After Maverick Viñales (Monster Energy Yamaha MotoGP) missed out on setting the fastest ever lap of Sepang by just 0.067s on Thursday, Friday saw action in Malaysia end on a high as not one but six riders went quicker than Jorge Lorenzo’s quickest effort in 2018. The quickest of them all, however, was Danilo Petrucci (Mission Winnow Ducati Team) as the Italian stormed the timesheets with an awe-inspiring 1m58.239s after 32 laps – with rookie Francesco Bagnaia (Alma Pramac Racing) hot on his heels and only a fitting 0.063s in arrears after 21 laps. Next came his teammate and Australian Jack Miller only another small margin further back, the Aussie doing 47 laps and quick despite a crash, with Andrea Dovizioso (Mission Winnow Ducati) completing the top four, three tenths off the top. 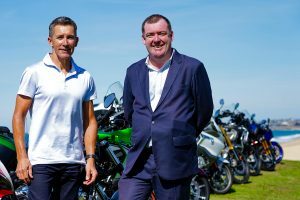 All in all, a stunner of a day for Ducati machinery. 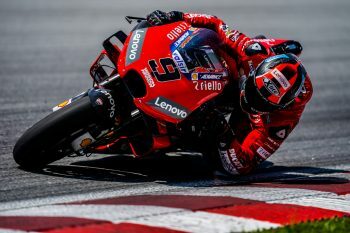 Dovizioso was positive after the day, although he said there’s still room to improve mid-corner, and team manager Davide Tardozzi continued the positivity. The Italian said the riders seem happy with many of the updates brought to the test, including chassis updates and a new fairing, and the long run pace of day two bodes well. Alma Pramac rider Miller put in a long run on day three too, with a good number of laps in the 2m and 2m1s bracket. Tito Rabat (Reale Avintia Racing) was a little further back on day three, but completed a positive test in P14. After the Ducati lock out at the top, it was Vinales who remained close. The Spaniard put his newly-numbered number 12 into fifth on the timesheets, setting a 1m58.644s as his best of a whopping 79 laps. Vinales’ long run pace was also electric – with the Yamaha rider putting in 20 laps in the 1m59s and 2m brackets. Teammate Valentino Rossi was 10th on the timesheets after more than 60 laps, and it was a positive test for the Iwata marque overall. Petronas Yamaha SRT, on their 2019 spec machines, also had another good showing on the timesheets. Franco Morbidelli was the second quickest Yamaha in P8 after 66 laps, with rookie teammate Fabio Quartararo in P16 after a mammoth 77 laps – just 0.011s behind rookie rival Joan Mir (Team Suzuki Ecstar). Behind Vinales, the final man to beat the 2018 fastest lap was Cal Crutchlow (LCR Honda Castrol) as the Brit took P6 overall and was fastest Honda once again despite returning from injury. The three-time grand prix winner crashed on day three once again but managed an increased 61 laps – a positive showing after so much time away – and did a best of a 1m58.780s. 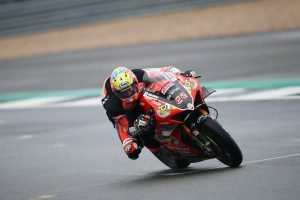 His teammate Takaaki Nakagami (LCR Honda Idemitsu), meanwhile, impressed once again as he completed day three in P9 and in the top ten – making that three days in a row. The Japanese rider was happy after the test and put in 61 laps on Friday. Reigning champion Marc Marquez (Repsol Honda Team) seemed relieved on the third day of testing to see the condition of his shoulder improved after a tough day two. The number 93 again finished work a little early to aid his recovery, but he did 39 laps with a best of a 1m59.170s and ended the day in P11 – just 0.015s off Rossi. Honda test team rider Stefan Bradl also added more than 50 laps to the count for the Japanese manufacturer, ending the day in P13, and tested a new aero fairing, as did Marquez. Aleix Espargaro (Aprilia Racing Team Gresini) was another who put in a stunning performance on day three, ending the session in seventh and only just outside Lorenzo’s quickest 2018 lap. He did 52 laps. Technical Director Romano Albesiano was positive about the laptime and the performance of the electronics and chassis, saying it’s been a positive winter and six days of testing so far are encouraging. Espargaro’s teammate Andrea Iannone, meanwhile, sat out the action due to illness. Team Suzuki Ecstar had a more low-key day on Friday, on the timesheets at least, with Alex Rins the highest-placed Hamamatsu machine in P12, 0.010s off Marquez but putting in 75 laps. Rookie Joan Mir made a big move up the rankings on day three though, ending the session in P15 and only three tenths off his teammate. Rins had positive things to say about Friday and especially about the test overall, with Suzuki aiming to keep their stunning 2018 form despite now having lost concessions for this season. Red Bull KTM Factory Racing saw Johann Zarco once again the fastest Austrian machine as the Frenchman took P17 with a 1m59.640s after 44 laps – but he only pipped teammate Pol Espargaro by just over a tenth. 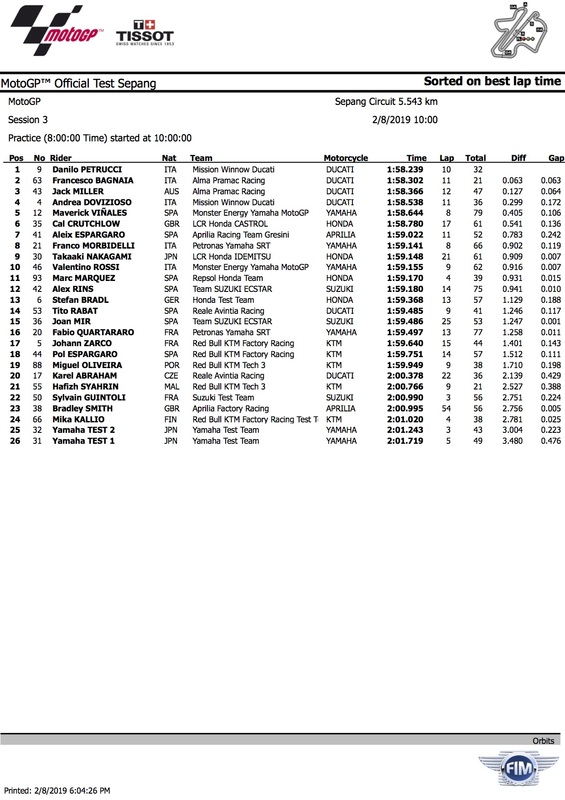 The Spaniard was P18, with Miguel Oliveira putting his Red Bull KTM Tech 3 machine just behind the two factory bikes. Chassis, suspension and aero were all being worked on, and long run pace was a positive for the Austrian factory. There were several versions of the aero package from KTM, and further testing will take place at Qatar before a decision is made. That’s it from Sepang and now that Qatar test looms large as the next chance for the grid to head out on track. That’s from the 23-25 February at Losail International Circuit.